RAWLINGS - Harding L. Barb, 69, of RD 3, died Thursday, July 26, 1990 at Sacred Heart Hospital, Cumberland. He was born Oct. 1, 1920 in Cumberland, son of the late Hazel (Boggs) Barb. Mr. Barb was an Army veteran of World War II. He was retired from PPG Industries, Inc., in Cumberland, and was a member of the Danvielle Church of the Brethren and Nancy Hanks Post 3518, Veternas of Foreign Wars, Keyser, W. Va. He is survived by his wIdow, Dora C. (Iser) Barb; one son, Kevin L. Barb, Westernport; two daughters, Carol A. Brown, Baltimore, and Kathy L. Riggleman, Keyser; three brothers, Gerald Barb, Linville, Texas; Donald Barb, Baltimore, Ronald Barb, Cumberland; four sisters, Thelma Jones and Dorthea Iser, both of Baltimore; Audrey Jewell, Cumberland; Elwanda Jackson, Pinto; and five grandchildren. Friends will be received Saturday from 2 to 4 and 7 to 9 p.m. at the Rotruck Funeral Home, Keyser. Services will be conducted in the funeral home chapel Sunday at 2 p.m. by Dr. William Miller. Interment will be in the Waxler Cemetery. Source: The Cumberland Times-News; Cumberland, Maryland; July 1990. ROCKWOOD - Mrs. Bessie Marie Barber, 59, died at her home at Rockwood. She was born in Black Township November 10, 1908, a daughter of Robert W. and Rosie Wilson Carolus. Her husband, David W., died 28 years ago. Surviving are two children, Clarence and Mrs. Ronald Benford, of Rockwood, three grandchildren, two brothers, Merle and Robert Carolus, of Rockwood R. D. 1, and a sister, Mrs. Irene Hoover, of Berlin, R. D.
WESTERNPORT, Md. - Elizabeth C. "Betty" Barcase, 74, of Moran Manor Nursing Home, formerly of Westernport, died November 24, 2003, at Keyser, W.Va. Born November 28, 1928, in Westernport, she was the daughter of the late Clarendon and Anna Pearl (Stuby) Davis. Mrs. Barcase was a member of Mt. Calvary Lutheran Church, Westernport. She was a 1946 graduate of Bruce High School, and a graduate of the Catherman Business School. "Betty" retired from Westvaco Corp. in 1993 with 43 years of service. Surviving is her husband of 54 years, Gregory Barcase; two sons, Gregory Barcase of Lusby, Md., and Jeffrey Barcase and wife Lisa, of Westernport. She is also survived by two grandchildren, Melissa Nesselrodt and husband, Rob, of Burlington, W.Va., and Christopher Barcase of Westernport; and two great-grandchildren, Alexa Sue and Chase Allen Nesselrodt of Burlington. The family will receive friends at the Boal Funeral Home, Westernport, on Wednesday. Funeral services will be conducted at the Mt. Calvary Lutheran Church, Westernport, on Friday, November 28, at 11 a.m. with Pastor Sally Bartling officiating. Interment will be in Philos Cemetery, Westernport. Memorials maybe directed to Mt. Calvary Lutheran Church or Tri-Towns Rescue Squad, Westernport. Gregory Barcase, 82, of Westernport, died Thursday, December 16, 2010, at his home. Born March 03, 1928, in Kitzmiller, he was the son of the late Gregory and Lucille (Patrone) Barcase. He was preceded in death by his wife, Elizabeth (Betty) Barcase; three brothers, John and Fred Barcase and Robert Sellers; two sisters, Angelina Staubitz and Susie Ganoe; and mother-in-law, Anna (Pearl) Davis. Mr. Barcase was a United States Army Veteran, having served in Japan during World War II. In 1989 he retired from Westvaco with over 39 years of service. At the time of his retirement he was the Multicraft Supervisor in the Maintenance Department. Mr. Barcase was a member of the Victory Post 155 American Legion, Westernport, and a member of Queens Point V.F.W., 6775, McCoole. He was a long time member of Mt. Calvary Evangelical Lutheran Church, Westernport. He was also an avid hunter and fisherman. Surviving are two sons, Gregory Barcase, Lusby, MD and Jeffrey Barcase, and his wife, Lisa, Westernport; two grandchildren, Melissa Nesselrodt, and husband, Rob, and Christopher Barcase, New Creek, WV; two great-grandchildren, Alexa and Chase Nesselrodt, New Creek, WV; one sister, Virginia Lee (Bucky) Roope, Kissimmee, FL. The family will receive friends at the Boal Funeral Home, Westernport, on Sunday. Funeral Services will be held on Monday at 1:00 p.m. at Mt. Calvary Lutheran Church, Westernport, with Pastor Sally Bartling officiating. Interment will be in Philos Cemetery, Westernport, with military honors accorded at graveside. LONACONING - Mrs. Bessie Barclay, 86, of Douglas Avenue, Lonaconing, died yesterday at Frostburg Community Hospital. Born in Lonaconing, Mrs. Barclay was a daughter of the late Wilson and Hannah (Johnson) Reiber. Her husband. Charles Barclay, also preceded her in death. Mrs. Barclay was a member of St. Peter's Episcopal Church, and a 59-year member of the Pythian Sisters of Lonaconing. Surviving are a daughter, Mrs. Mary Matilda Wilson, LaVale, and two sons, Wilson Barclay, Lonaconing, and Robert Barclay. Frostburg, seven grandchildren and 15 great-grandchildren. Friends will be received in the Eichhorn Funeral Home today from 7 to 9 p.m. and tomorrow from 2 to 4 and 7 to 9 p.m. Services will be conducted in the funeral home Friday at 10:30 a.m. by the Rev. Leslie Miles. Interment will be in Oak Hill Cemetery. Published Wednesday, December 17, 1975 in THE EVENING TIMES, Cumberland, Maryland on page 32, col. 1. Lonaconing, Nov. 19. — Charles Barclay, 68, retired miner, died yesterday afternoon at his residence, 76 Douglas avenue, after an illness of several years. He was born in Lonaconing, a son of the late Robert and Mary Barclay. Besides his widow, Mrs. Bessie (Reiver) Barclay, he is survived by two sons. Robert Barclay, of Frostburg, and Willon Barclay, of Lonaconing; a daughter, Mary Matilda, at homo; two brothers, Alexander Barclay, of Lonaconing, and John Barclay, a resident of Nebraska; three sisters, Mrs. Margaret Ralston and Mrs. Mimi Smith, both of Lonaconing, and Mrs. Daniel Rowan, of Cleveland, and four grandchildren. Funeral services will be held Thursday at 2 p. m. at the, home with the Rev. John E. Stacks, Methodist minister, officiating, Interment will take place in Oak Hill cemetery. Published Tuesday, November 19, 1946 in THE EVENING TIMES, Cumberland, Maryland on page 16, col. 2. LONACONING — Garlitz Barclay, 63, of Beechwood Street, manufacturing specialist and packaging coordinator for Celanese Fibers Company, died Sunday (October 3) at his residence. Born here, he was the son of the late Alex and Veronica (Garlitz) Barclay. Mr. Barclay attended Rochester Institute of Technology for studies in quality control for chemical industries. He was a past president of the Lonaconing Rotary Club; associate member of the Research Institute of America, Inc.; had served as president of the Tri-State Quality ControI group, forerunner of the Cumberland Section of the American Society of Quality Control; served as chairman for the first County United Way and Heart Fund drives here; was committeeman for Explorer Post 26, Boy Scouts, and had also served as its chairman in 1958-59. Surviving are his widow, Mary "Babe" (Atkinson) Barclay; one daughter, Mrs. Kathryn Luzier, Cresaptown; two sons, William Garlitz Barclay, here; Paul Barclay, Westernport; two brothers, Alex Barclay and George Barclay, both of here; five sisters, Miss Kathleen Barclay, here; Mrs. Elnore Bell, Baltimore; Mrs. Betty Lou Piquet, LaVale; Mrs. Anna Mae Layman, Frostburg; Mrs. Adele McAlpine, Tennessee, and seven grandchildren. Friends will be received at the Eichhorn Funeral Home today from 2 to 4 and 7 to 9 p.m. Mass of the Christian Burial will be celebrated Wednesday at 9 a.m. in St Mary's Catholic Church here. Interment will be in St. Joseph's Cemetery, Midland. The rosary will be recited at the funeral home today at 7:30 p.m.
Mrs. Alex Barclay – Lonaconing – Mrs. Veronica Barclay, 69, wife of Alex Barclay, died yesterday in Memorial Hospital, Cumberland. Born at Avilton, she was a daughter of the late Richard and Susie (Blocker) Garlitz. Surviving besides her husband are three sons: Garlitz, George and Alex Barclay, Jr., all of Lonaconing; five daughters, Mrs. Joseph Bell, Baltimore; Mrs. George McAlpine, Elyria, Ohio; Miss Kathleen Barclay, Lonaconing; Mrs. Raymond Piquett, LaVale; and Mrs. William Layman, Frostburg; a brother, Earl Garlitz of Garrett County; s sister, Mrs. Charles Hanlin of Garrett County; 20 grandchildren and three great-grandchildren. The body is at the Eichhorn Funeral Home. A requiem mass will be celebrated Monday morning at St. Mary’s Catholic Church and interment will be in the parish cemetery. Della Jean Barello, 88, Oakland, died Friday, Oct. 14, 2011, at Garrett County Memorial Hospital. Born Sept. 14, 1923, at Sang Run, Della was a daughter of the late Thomas W. and Della A. (Rodehaver) Savage. She was also preceded in death by her husband, Alphonso Barello Jr. Della worked for many years at Englander's. She was a member of St. Paul's United Methodist Church, Oakland, and the American Legion Women's Auxiliary. She is survived by two sons, Phillip Ward and wife Alice, New Jersey, and Larry Ward and wife Debbie, Westminster; two stepsons, Lee "Sonny" Ward, New Jersey, and Jerry Barello and wife Dorothy, Oregon; 14 grandchildren; 10 step-grandchildren; two step-great-grandchildren; one sister, Martha Jane Lawton; and two brothers, Donald and Samuel Savage. Friends were received at David A. Burdock Funeral Home, Oakland, where a funeral service was conducted on Wednesday, Oct. 19, with the Rev. Donald Matthews officiating. Interment followed in Oakland Cemetery. Online condolences may be made to the family at www.burdockfuneralhome.com. Carl A. Barge, 53 years old, died at 3:45 o'clock Tuesday afternoon at his home at 521 Race street after a lingering illness. Mr. Barge was born in Connellsville, February 14, 1892, the son of the late John H. and Emily A. Barge, and had spent his entire life in Connellsville. He was employed at Anchor Hocking Glass Corporation in its chemistry department. He was a member of the First Presbyterian Church. Surviving are his widow, Mrs. Clara Murphy Barge; one son, David A. Barge, and one sister, Miss Blanche B. Barge. The funeral service will be held at 2 o'clock Friday afternoon at the Charles C. Mitchell funeral chapel in South Pittsburg street. Dr. Herbert Braun, pastor of the First Presbyterian Church, will officiate. Burial will be made in Hill Grove Cemetery. Mrs. Adeline Virginia Barham, 75, of 456 North Centre Street, died Sunday at Memorial Hospital. Born in this city, she was a daughter of the late Joseph A. McKenzie and Cecilia (Whitacre) McKenzie. She was preceded in death by her husband, Charles Ernest Barham. Surviving are four daughters, Mrs. Charlotte A. Cunningham, Fort Lauderdale, Fla.; Mrs. Patricia A. Donahoe, Clearville, Pa., Mrs. Dorothy L. Rockwell and Mrs. Sondra K. Wickard, both here; and a son, John E. Barham, BelAir, Md. ; a sister, Mrs. Regina Young, city; a brother, William Paul McKenzie, Potomac Park; 11 grandchildren and two great-grandchildren. Arrangements by Leisure-Stein Funeral Home. Services will be held Tuesday at 9 a.m. in the funeral home. Interment will be in Sunset Memorial Park. Mrs. Ann Elizabeth Barker, 84, died Sunday in the Allegany County Infirmary after a lingering illness. She formerly lived at 811 Fayette Street. Born in Frostburg, she was a daughter of the late John L. and Katherine (Pfiffer) Heintz. Her husband, George Lindsay Barker, preceded her in death. She is survived by two sons, John L. Barker of Norwalk, Conn., and Harry H. Barker, Mansfield, Ohio; one brother, Dr. Karl P. Heintz, Cumberland; a sister, Mrs. Rosella Landis, Cumberland; eight grandchildren and three great-grandchildren. The body will be at the Stein Funeral Home. Services will be conducted tomorrow at 10 a.m. at the funeral home by Rev. Kenneth E. Morelock. Burial will be in Rose Hill Cemetery. Mrs. Barker was a member of St. Paul's Lutheran Church. Edward Barker, who was run over by No. 6 westbound train on the Baltimore and Ohio railroad, last Wednesday evening about 8 o'clock, was buried in the Philos cemetery at Westernport today. Barker was about 38 years of age and leaves a wife and two children. He resided at the Junction, about one mile west of Piedmont, and when near his home stepped out of the way of a "helper" and got in front of No. 6. The injured man was conveyed to his home, where he died yesterday morning at 5 o'clock. Published April 10, 1885 in the CUMBERLAND DAILY TIMES, Cumberland, Maryland on Page 1, Col. 5. April 10, 1867 In this town, on the morning of the 13th inst, at the residence of Mr William Davis, after a lingering illness. Mr Enoch Barker, in the 83rd year of his age. He was for many years a resident of this town. KITZMILLER MD - Prof. and Mrs. I. F. Groves were called to Keyser Friday evening of last week on account of the serious illness of Mrs. Groves father, Mr Mathias Barker, who died on Saturday night, at that place, at the home of his son, Mr. Geo Barker, after a lingering illness of some months. Mathias Barker, of Swanton, Md., died Saturday evening, January 11, 1913, at the residence of his son, William Barker, in Keyser. Mr. Barker had been for some time in declining health, and the end came more as the result of the infirmaries of old age than to any particular malady. The body was accompanied by many relatives and friends to Swanton, for interment Tuesday, January 14th. Hyndman, Pa., Dec. 4—Mrs. Jennie Viola Barkley, wife of the late Robert C. Barkley, died at her home yesterday. A native of Fairhope, Pa., she was the daughter of the late Jesse and Emmaline Baker Deremer. She is survived by two children, Mrs. Helen Miller, Frostburg, and Allen Barkley, this place; one brother, Charles Deremer, Plttsburgh, Pa.; and two sisters. Mrs. A. W. Clarkwood, Fairhope, Pa., and Mrs. Edward Schaulis, Boswell, Pa. She was a member of the Hyndman Reformed Church. ROCKWOOD, June 25 — Mrs. Elizabeth Barkman, 88, died Monday at the home of her son, Frank, at Rockwood, R. D. 1. The widow of Jacob S. Barkman, who died in 1928, she was the daughter of the late Mr. and Mrs. Jonathan Stahl. She leaves four children, Frank and Mrs. W. C. Beck of Rockwood, R. D., Mrs. Harvey Grant of Garrett, and Mrs. Arthur Brougher of Rockwood, 25 grandchildren, 33 great-grandchildren, and three brothers. A requiem high mass will be celebrated for Mrs. Agnes Elizabeth Barley, 83, a former resident who died Sunday at the home of her son, John F. Barley, 540 Keefe Street, Pittsburgh, tomorrow at 9 a. m. at St. Patrick's Catholic Church. Interment will in the church cemetery. She is survived by a daughter, Mrs. John Reed, this city; four other sons, Henry W. Barley, Los Angeles; Joseph J. Barley, Ridgeley;.Espy T. Barley, this city, an Richard A. Barley, Tucson, Arizona; two brothers, Joseph Lehman, Lima, Ohio, and James T. Lehman, Norfolk; three sisters, Mrs. Frank Moran and Mrs. Rose Lindner, both of this city, and Mrs. Norma Logsdon, Baltimore; and four grandchildren. The Catholic Daughters of America and Sacred Heart Hospital Auxiliary will recite the rosary at the George Funeral Home today at 7 p. m. The Christian Mothers will also recite the rosary at the funeral home at 7:30 p. m. Pallbearers. will be Charles Shotting, Michael Kenny, Samuel I. Brown, Richard W. Pratt, Ferdinand Preaskorn and James W. Ward. The funeral of Alphonsus Barley who met such a tragic death in the Ridgeley yard on Saturday took place this morning. The funeral was an exceptionally large one as the deceased was one of the best liked of railroad men in the city. Service consisting of a requiem high mass celebrated by Rev Fr Dacey was held in St Patrick's Catholic Church. Interment was made in the church cemetery. The members of the B R T attended the funeral in a body. Mrs. Anna Mary Barley, 79, wife of Frank H. Barley, died this morning at her home, 184 North Centre Street. She was born in Bedford county, Pa., a daughter of the late Espy A. and Elizabeth (McMahon) Lehman. Mrs. Barley was a resident of Cumberland for many years and a member of St. Patrick's Catholic Church. Besides her husband she is survived by three daughters, Mrs. Anne M. Everline, at home; Mrs. Clement J. Helmstetter, Cash Valley Road; and Mrs. Catherine Eerligh, Washington; a son, Edward Leo Barley, of Cumberland; a brother, James E. Lehman, Perry Point, Md. ; and four sisters, Mrs. Agnes Barley, Pittsburgh; Mrs. O. J. Logsdon, Baltimore, and Mrs. Frank Moran, and Mrs. Charles Lindner, both of Cumberland. The body is at the George Funeral Home. Edward Leo Barley, 71, of 617 Henderson Avenue, died yesterday at MemoriaI Hospital, where he had been a patient several weeks. Born in Cumberland, he was a son of the late Frank H. and Annie (Lehman) Barley. He was a retired Queen City Brewery employe, a member of United Brewery Workers Local, St. Patrick's Catholic Church, Holy Name Society, St. Vincent DePaul Society, and a 50-year member of Cumberland Council 586, Knights of Columbus. Surviving are his widow, Anna C. (Fradiska) Barley; a son, Edward F. Barley, Saint Croix, Virgin Islands; a daughter, Miss Patricia Ann Barley, at home; three sisters, Mrs. Mary Helmstetter, Cash Valley Road; Mrs. Catherine Eerleigh, Baltimore, Mrs. Ann V. Everline, Annapolis, and two grandchildren. The body will be at the Leasure-Stein Funeral Home, where friends will be received today from 7 until 9 p.m. and tomorrow from 2 until 4 and 7 until 9 p.m. A Christian wake service will be held there tomorrow at 8 p.m. Mass of Christian Burial will be celebrated Monday at 11 a.m. at St. Patrick's Church. Interment will follow in the parish cemetery. Frank Henry Barley, 91, a retired local businessman, died this morning at the home of his daughter, Mrs. Clement J. Helmstetter, RD 1, city; Cash Valley Road. A native of Somerset County, Pa., he was born October 5, 1871 a son of the late Thomas and Catherine (Weber) Barley. His wife, Anna M. (Lehman), died in 1952. After graduation from St. Patrick's School, which then was located in a log-cabin type buildng where Carroll Hall now stands, Mr. Barley went to work at the John A. Fulton Book Shop which was located at the site of the Fort Cumberland Hotel at one time. Mr. Barley was employed by the Fulton firm until the retirement of Mr. Fulton after which continued operation of the business was the Frank.H. Barley Book Shop. He retired in 1942. He was a member of St. Patrick's Catholic Church, a member and past grand knight of Cumberland Council 586, Knights of Columbus; a member and past president of the Holy Name Society of St. Patrick's, and a past president of the Western Maryland Section of the Holy Name. Besides his daughter he is survived by two other daughters, Mrs. Catherine Eerligh, Baltimore, and Mrs. Anne Barley Everline, Annapolis; a son, Edward Leo Barley, city, and eight grandchildren. The body is at the George Funeral Home where the family will receive friends today from 7 to 9 p. m. and tomorrow from 2 to 4 p. m. and 7 to 9 p. m.
George Barley, a popular young man residing with his parents in South Cumberland, died at four o'clock this morning from heart disease. The deceased was only 18 years of age and enjoyed the friendship of all who knew him. His funeral will take place Thursday from the residence of the father, No 59 Wine Street, at an hour yet to be set. The remains will be taken to St Patrick's church where mass will be celebrated. The interment will be made in St Patrick's cemetery. Thomas T. Barley, B. & O. watchman at the Oldtown road crossing, Cumberland, died very suddenly Sunday, April 28, aged 64 years and six months. Mr. Barley was born in this county but had lived in Cumberland for 40 years. About 38 years ago he was married to Catharine Weber of New Baltimore, who passed away two years ago. He had been in the employ of the B. & O. for 25 years. Deceased is survived by three sons, all residing in Cumberland. Mr. Barley was a brother-in-law of Henry F. Weber of near Bedford. Services were held in St. Patrick's church Tuesday morning; interment at Cumberland. A requiem mass will be held tomorrow at St. Patrick's Catholic church for William F. Barley, 75, of 620 Elm street, who died at his home yesterday morning. Interment will be in the church cemetery. A native of Cumberland, and a son of the late Thomas J. and Catherine (Weber) Barley, Mr. Barley was a member of St. Patrick's church, and of the Holy Name Society of the church. He was a carpenter by trade. Surviving are his widow, Mrs. Agnes (Lehman) Barley; five sons Henry Barley, of New York City; Joseph and Richard, with the Army overseas, and Espy Barley, with the Army in the United States; John Francis Barley, serving in the Navy; a daughter, Mrs. John Reed, Cumberland, and a brother, Frank H. Barley, also of this city. Meyersdale - Norman Harrison Barmoy, 63, died Monday in Meyersdale Community Hospital. An employe of the Western Maryland Railway Company for 45 years, he was the station agent here for 15 years. Born in Meyersdale on December 18, 1894, he was a son of the late Augustus and Nancy (Wilhelm) Barmoy. Surviving are his widow, Mrs. Mary Jane (Austin) Barmoy; a daughter, Mrs. Joseph Page, Fort Meade, Md. ; three sons, R. Max Barmoy, Fort Bliss, Texas; John W. Barmoy, LaVale, Md. ; James B. Barmoy, at home; three sisters, Mrs. Charles Decker, Warren. Ohio; Mrs. Roy Bungard, here, and Ella Engle, Columbiana, Ohio. Also surviving are a brother, Albert Barmoy, RD 3 Meyersdale, and six grandchildren. Mr. Barmoy, a veteran of World War I, was a member of the Order of Railway Telegraphers and Charles E. Kelly Post, American Legion, here. The body is at the Price Funeral Home where a service will be conducted on Friday at 2:30 p.m. with Rev. L. Collins, pastor of the Meyersdale Reformed Church. Interment will be in Union Cemetery. Mrs. Alice L. Barnard, 74, of 609 Greene Street, died this morning in the Allegany County Infirmary where she had been a patient since February 21. She had been in ill health five years. A native of Oldtown, she was a daughter of the late Francis and Laney M, (Shryock) Darkey. Her husband, Notley Barnard, died in 1945. Mrs. Barnard was a member of Centre Street Methodist Church. Survivors include a daughter, Mrs. B. F. Mitchell Jr., Petersburg, W. Va.; a son, Notley R. Barnard, Baltimore; two brothers, Newton F. Darkey, Pittsburgh, and William A. Darkey, this city, two sisters, Mrs. Guy J. Spear and Mrs. Margaret Workmeister, both of this city, and two grandchildren. The body is at the George Funeral Home where the family will receive friends today from 7 to 9 p.m. and tomorrow from 2 to 4 a.m. and 7 to 9 p.m. The family requests that flowers be omitted. Died at her home near Deer Park, Monday night at 9.30 o'clock after an illness extending over several months, the result of dropsy, Mrs. Augustus Barnard, aged 48 years. The deceased leaves beside her husband several children, the youngest an infant of less than a year. George Kenneth "Bud" Barnard, 90, of Kitzmiller, went home to be with his Lord and Savior on Tuesday, June 14, 2016, at Ruby Memorial Hospital in Morgantown, W.Va. Born on June 6, 1926, in Kitzmiller, he was the son of the late Thomas and Bertha (Boyce) Barnard. He was a veteran of the United States Army, having served during World War II. Prior to retirement, George worked as a coal miner. He enjoyed spending time with his family and friends. He is survived by three children, Charles Barnard and wife, Darlene, of Winchester, Va., Kenneth Barnard and wife, Debra, of Terra Alta, W.Va., and Suzette Harold and husband, Randy, of Kitzmiller; six grandchildren; ten great-grandchildren; and a number of nieces and nephews. In addition to his parents, he was preceded in death by his loving wife of 57 years, Alma Mae (Paugh) Barnard, in 2011; a daughter, Alma Virginia Hardesty; three sisters, Mary Evans, Elsie Miller and Eulalia Evans; and three infant brothers. Friends will be received at the C & S Fredlock Funeral Home, P.A., 710 Church St., Kitzmiller, on Thursday, June 16, 2016, from 2 to 4 and 6 to 8 p.m. A funeral service will be held in the funeral home on Friday, June 17, 2016, at 11 a.m. with Pastor John Friend officiating. Interment, with military honors, will follow in the Kalbaugh Cemetery, Elk Garden, W.Va. Condolences for the family may be left at www.csfredlockfh.com. Died, at the home of his father, Rev. W. H. Barnard, near Bloomington, on Thesday, Harry Barnard, aged 18 years. About five years ago the young man received injuries in a mine near Bloomington which rendered him a helpless invalid, affecting his spine. As a result of these injuries his death ensued. His funeral took place yesterday. Mrs. Belle Peebles Barnard, aged 77 years, widow of James Barnard, a former resident, died Wednesday in Roanoke, Va., following a long illness. Mrs. Barnard was the daughter of the late Thomas and Janet Peebles, and was born in Frostburg. She was the last member of her family which following her marriage Mrs. Barnard resided in Lonaconing for a number of years before moving to Virginia. She is survived by three daughters: Mrs. Hayden Brickey, Mrs. Waldo Robertson and Miss, Nettie Barnard, all of Roanoke, and three sons, William, of Nebraska: Clarence, South Carolina, and Thomas Barnard, Salem. Va. Funeral services were conducted today at her home. Interment was at Roanoke. Mrs. Mary Price, this place, her niece, left Thursday evening for Roanoke to attend the obsequies. FYI - The obit says 'Mrs' and 'her', but it should be 'Mr' and 'his'. Death of Mrs. James Barnard. Mrs. James Barnard, of Eckhart Mines, died Friday at her home at that place. She was the widow of the late James Barnard, of Eckhart, and was 77 years of age. She was a member of a large and influential family in the county, being connected by marriage with Joseph Knode, David Knode, Squire John C. Wise, Robert Porter, of Eckhart, and a number of other well known people. The funeral of the late John D. Barnard took place yesterday afternoon at 2 o'clock from the M. E. Church at Moscow. Tev. Mr. Evans officiated, assisted by ministers from Keyser and Piedmont. The funeral was one of the largest ever witnessed in Allegany county, people attending from all sections of the surrounding territory. No man ever stood higher in the estimation of neighbors and friends than did the deceased, and his death is mourned not only by relatives but by almost every one in the locality where he lives. The pallbearers were Messrs. A. B. ? Shaw, John W. Young, James Dawson, Henry Cruetzburg, Geroge Andrews and Lawson Patterson. Interment was made in Laurel Hill cemetery. John G. Barnard died at his home in Garrett county, Md., on the 7th day of September, 1880, aged 59 years, 11 months and 6 days, after a lingering illness of six years. He was regarded by all who knew him as a worthy citizen, and he was a worthy and acceptable member of the United Brethren church for many years. John H., son of Otho and Martha A. Barnard, died January 12, 1901, at his home near Chestnut Grove, of an abscess resulting from typhoid fever, which he contracted in July. The deceased was in his 22nd year, and just budded into manhood.The funeral sermon was preached by Rev. J. H. Howard, of Bloomington, to one of the largest concourse of friends and relatives ever seen on a like occasion. The community has met with such a loss that it cannot soon recover, as John was one of the very best young men. He was a living example - sober, quiet and industrious at all times. About ten days before his death, when the abscess opened, he told his mother, who was waiting on him at the time, that he was ready to die and requested that his sister, who was absent, meet him in heaven. We would say to the parents, brothers and sisters, weep not as those who have no hope. He will all your sorrows heal. He to Paradise is fled. Never can return to thee. B.H. BARTON — Mrs. Lillian H. Barnard, wife of Frank Barnard, was found dead in bed Sunday on her seventy-third birthday. The body is at the home of Hugh Young, where service will be held at 2 p.m. tomorrow. Rev. Wendell Allen, pastor of Barton Methodist Church, will officiate, and interment will be in Fort Ashby, W.Va. Cemetery. The sad death of Robert Barnard, aged about 18 years, occurred at Albrightsville, on last Sunday night in a way that will never be known. Br. Barnard was employed in a saw mill in town and boarded with a family nearby. He and the family had retired as usual on Sunday evening and about midnight Mr. Barnard heard a commotion in the cicken coop and awoke one of the members of the family to obtain his gun. The next morning his body was found near the coop with the entire tip of his head blown off and the empty gun by his side. He was a son of Mr. Augustus Barnard, of near Swanton, where his remains were brought on last Monday and interred in the family burial ground on Wednesday morning at 10 o'clock. He was a nephew of Mrssrs. Otho and Bonse Barnard, of this place, who attended the funeral. Mr. S. Fuller Barnard died very suddenly at his home, North Mechanic street, last night at 11 o'clock. Mr. Barnard had left his cigar store early in the evening and gone to his home. He seemed in excellent spirits and was chatting with his wife when he suddenly sank back in his chair unconscious and when Dr. W. W. Wiley, who was quickly summoned, reached the house, Mr. Barnard's spirit had fled. The deceased was a member of one of the oldest and most prominent families in Western Maryland. His father, Mr. Wm. R. Barnard, represented Garrett county in the General Assembly for several sessions and was a speaker of considerable ability and very popular in this section of Maryland. The deceased was 51 years of age and is survived by his widow, who was Miss Bridget Barrett, of Mt. Savage, four daughters, his mother, two brothers, William and Ward, of this city, and two sisters, Mrs. Philip Kahl(?) and Miss Barnard, of Cumberland. He was a cousin of Mr. Fuller Barnard, former sheriff of Allegany county. Mr. Barnard was a locomotive engineer on the C. & P. until the G.C. &C. road was built, when he made master of engines for that road, which position he held until January 1, 1904. A few months ago he started a cigar and tobacco store on Baltimore street. The deceased was a prominent and active Democrat, but never held any office. He had very many warm friends and the announcement of his sudden death caused much sorrow. The funeral will take place Monday morning with services at St. Patrick's church at 9 o'clock. The funeral of Mr. Fuller Barnard took place this morning with requiem high mass in St. Patrick's church at 9 o'clock. Rev E. J. Connely officiated. A large congregation, including numerouse warm friends of the deceased from different sections of the county, were at the services. The pall bearers were Messers. John McMullen, Daniel McMullen, Roderic Clary, J.P. Gaffney, Richard Arnold and Bernard Coyle. 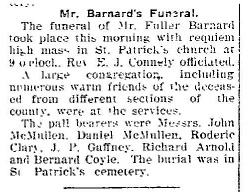 The burial was in St. Patrick's cemetery. Thomas Barnard, a well known engineer on the Baltimore and Ohio railroad, was killed at Rowelsburg Sun and his funeral took place at Frostburg Tues. The accident occurred at noon Sun. He was called for an extra helping engine west and was passing over the tracks stepping from the eastbound track to the west, when he was caught by engine No 165 and almost instantly killed. For upwards of 12 years, he ran out of South Cumberland. Several years ago he took a position over the "Hill" and has been running there ever since. He was married and is survived by three children. Mrs. Agnes Bogk Barncord, 76, of Ellerslie Road, died yesterday. She was the widow of Oliver P. Barncord who died about seven years ago. Mrs. Barncord was a member of the Evangelical Church of Frostburg. She is survived by three sons, Norman, of Harlowton, Mont. ; Raymond, Corriganville; Francis, at home; three daughters, Mrs. C. E. Dobbin, Demer, Colorado; Mrs. William Hausman, Connellsville; and Mrs. W. L. Bowers, of this city. The family has requested that flowers be omitted. The body will remain at the Hafer Funeral Home. LEONARDTOWN — Arthur Scott Barncord, 57, of California. died Feb. 9, 2010, at St. Mary’s Hospital, Leonardtown. Born March 12, 1952, in Cumberland, he was the son of the late Edward Scott Barncord and Nina Loeber Barncord. In addition to his parents, he was preceded in death by his grandparents, Winfield Scott and Martha Lapp Barncord and Arthur and Leone Loeber. He grew up in Corriganville, and was a graduate of Mount Savage High School. He enlisted in the Air Force in February 1971 where he served at Andrews AFB, Okinawa, and Taiwan. He was honorably discharged in 1978. In 1980, he accepted an active duty military position with the District of Columbia Air National Guard, a subsidiary of the USAF, Detachment 1, Andrews AFB. During his tenure with Det. 1, he had the pleasure of traveling to all fifty states and numerous overseas countries. He retired in 1996 with twenty-four years of active duty military service. He joined Thos. Somerville Co. in 1997 as a driver, where he remained until his death. He was an avid history buff, including his own family genealogy. He spent countless days pouring over records at the National Archives, local courthouses and graveyards, before the days of the internet. He grew up loving all aspects of the railroad in the shadow of his father, a railroader. His interest in cars began in his youth where it culminated with a passion for the Volkswagen product. His most recent interest and constant companion was Bunnyman, his daughter’s lion head pet rabbit. He bunny sat one week and never relinquished the rabbit back to her. His most passionate love of all, though, was spending time with his children, Kimberly and Andrew. He is survived by his children, Kimberly Ann Barncord, of Alexandria, Va., and Andrew Scott Barncord, of Issue; his former spouse, Suzanne Hay Barncord, also of Issue; stepmother Frances Barncord, of Corriganville; brothers Mark Barncord, of Owings, and Eric Barncord, of Cumberland; sister Monica Gray, of Moundsville, W.Va.; as well as beloved in-laws, aunts, uncles, cousins, nieces, and nephews. Visitation and funeral services will be at Arehart-Echols in LaPlata on Saturday, Feb. 13, 2010, from 4 to 7 p.m. Following cremation, a memorial service will be held on Saturday, Feb. 20, 2010, at 2 p.m. at St. John’s United Church of Christ, Corriganville, in their church hall. Burial will be private at Cook’s Cemetery, Wellersburg, Pa. In lieu of flowers, memorial contributions may be to the Hollywood Volunteer Fire Department, P.O. Box 7, Hollywood, MD 20636 or Bunny Magic Rescue, a 501(c)3 organization, c/o Carole Van Wie, 1309 Tongue Cove Drive, Lusby, MD 20657. David S. Barncord, 61, died this morning at his home, 459 Bedford street, after an illness of several months. He was married twice and is survived by his second wife, one son and two daughters by his first marriage. He is also survived by seven brothers, John, Thomas, Samuel, Oliver, Tolbert and Henry Barncord, and one sister, Mrs. Norman Shockey. CORRIGANVILLE -- Edward S. Barncord, 71, of Poorbaugh Hill, Corriganville, died Wednesday, June 13, 2001, at Sacred Heart Hospital. Born on Jan. 11, 1930, in Rockwood, Pa., he was the son of the late Walter Scott Barncord and Martha (Lapp) Barncord. He was also preceded in death by his first wife, Nina Lee (Loeber) Barncord on March 9, 1965, and three brothers, Olen Mosser, David Mosser and Howard Barncord. Mr. Barncord was a retired operator with CSX with 42 years of service. After retirement he was most happy working in his wood shop. He also enjoyed genealogy and learning to speak in German. He was a member of the Kemp Lodge 154 A.F. and A.M., Mount Savage. Surviving are his wife of 35 years, Frances Grace (Resh) Barncord, two sisters, Orpha Catherine "Catty" Crabtree and Martha Louise Crites, both of Corriganville; one brother, William Francis "Barney" Barncord; three sons, Arthur Scott Barncord, California, Md, Mark Barncord, Dunkirk, and Eric Barncord, Cumberland; one daughter, Monica Armstrong, Corriganville; seven grandchildren; and one great-grandchild. Friends will be received at Newman Funeral Homes, P.A., 179 Miller St., Grantsville, on Thursday from 7 to 9 p.m. and Friday from 2 to 4 and 7 to 9 p.m. Funeral services will be conducted at the funeral home on Saturday, June 16, at 1 p.m. Interment will be in Grantsville Cemetery. Mrs. Elizabeth Barncord, 85, widow of David Barncord, died yesterday morning at the home of her sister, Mrs. Otto Hafer, 363 Bedford Street, with whom she resided several years. She was a seamstress most of her life. Born in Cumberland, Mrs. Barncord formerly lived at 907 Bedford Street. Her parents were the late Henry and Catherine (Smith) Kohl. She was a member of Zion Evangelical and Reformed Church. Surviving besides Mrs. Hafer are a number of nieces and nephews. The body is at the Hafer Funeral Home where services will be held tomorrow at 2 p. m. with Rev. Frederick D. Oberkircher, pastor of Zion Evangelical and Reformed Church, officiating. Interment will be in Greenmount Cemetery. GREENPOINT — Mrs. Elsie Lavinia Barncord, 55, of RD 1, died yesterday at her home. Born in Cumberland, she was a lifelong resident of Greenpoint and was a daughter of the late Richard and Effie Ella King. She was a member of Fairview Avenue United Methodist Church. Surviving are her husband, William Carl Barncord; sons, Carl W. Barncord, Dennis K. Barncord, Akron, Ohio; Gary M. Barncord, Cumberland; Boyd A. Barncord, at home; one half-brother, Richard Zimmerman, California; one half-sister, Mrs. Betty Honeck, Canal Fulton, Ohio, and several grandchildren. The body is at the Scarpelli Funeral Home where friends will be received today from 7 to 9 p. m. and tomorrow from 2 to 4 and 7 to 9 p. m.
Mrs. Emma Treverton Barncord, 80, of 124 Main Street, Ridgeley, died yesterday in Sacred Heart Hospital where she had been a patient six days. Born in Pine, Pa., she was a daughter of the late Richard and Lucinda Lee. Her husband, Joseph Barncord, died in 1950. She is survived by three daughters, Mrs. Ralph Orndorff, Ellerslie; Mrs. Frank Oss, RD 1, Valley Road; and Mrs. Homer Simmons, Ridgeley, with whom she resided; two sons, Calvin Lee Barncord, Baltimore, and Joseph C. Barncord, Mt. Wilson, Md. ; two brothers, George Lee, of Texas, and Glenn Lee, Pueblo, Colorado; sisters, Mrs. Bertha McMackin and Mrs. Oscar Wrenrick, both of Saxton, Pa., 12 grandchildren and 12 great- grandchildren. The body is at the Hafer Funeral Home. Service Thursday; interment Hillcrest Burial Park. CORRIGANVILLE — Frances Grace Barncord, 78, of Corriganville, died after a long, courageous battle with ovarian cancer on Thursday, Dec. 19, 2013, at her residence. Born Nov. 3, 1935, in Grantsville, she was the daughter of the late Arthur and Grace (Yost) Resh. She was also preceded in death by her husband, Edward S. Barncord, June 13, 2001; and one son, Arthur Scott Barncord. Mrs. Barncord was a hairdresser and she enjoyed spending time with her grandchildren and hosting game nights with her family and friends. She is survived by two sons, Mark Barncord and wife, Jeri, Dunkirk and Eric Barncord, Cumberland; one daughter, Monica Gray and husband, Bob, Proctor, W.Va.; two sisters, Mary Kamp, Grantsville and Doris Cross, Cumberland; 10 grandchildren, Guy Armstrong, Celina Armstrong, Amanda Gray, Bobby Gray, CJ Gray, Kimberly Barncord, Andrew Barncord, Nick Barncord, Heather Barncord and Cody Barncord; three great-grandchildren; and also a number of special nieces and nephews. The family would like to extend a heartfelt thank-you to her close friends who acted as her caregivers. Friends will be received at the Newman Funeral Homes, P.A., 179 Miller St., Grantsville, on Saturday from 2 to 4 and 7 to 9 p.m. Services will be conducted in the funeral home on Sunday, Dec. 22, 2013 at 2 p.m. with Pastor Jim Book officiating. Interment will be in the Grantsville Cemetery. George H. Barncord, 80, of 854 McMullen Highway, died Saturday at Baker VA Center, Martinsburg, W.Va., where he had been a patient seven weeks. Born at Mt. Savage, Mr. Barncord was a son of the late Samuel M. and Minnie (Bohg) Barncord. His wife, Vada P. (Drumm) Barncord, preceded him in death. A veteran of World War I, he was a former employe of Celanese Fibers Company. Mr. Barncord was a charter member of the Frostburg Elks Lodge and was a member of St. George Episcopal Church, Mt. Savage, and the El Fidel Club. Surviving are several nieces and nephews. The body is at the Silcox-Merritt Funeral Residence where friends will be received from 7 to 9 p.m. Services will be conducted there tomorrow at 11:30 a.m. by Rev. William Haire. Burial will be in SS. Peter and Paul Cemetery. The Frostburg Elks will conduct a memorial service today at 7:30 p.m. at the funeral home. Henry Orlando Barncord, 81, husband of Mrs. Mary Ann (Retallick) Barncord, died this morning at his home in Corriganville. Born October 5, 1869, in Corriganville, he was a member of Fort Cumberland Lodge No. 211, A. F. and A, M.; Knights of Pythias, Jr. O. U. A. M., and Corriganville Methodist Church. Surviving, besides his widow, are two daughters, Elsie and Henrietta Barncord, Corriganville; three sons, David Henry Barncord, this city; John Mitchell Barncord, LaVale; and William Carl Barncord, Corriganville; and a brother, Edward Barncord, Hyndman, Pa.
Henry Thomas Barncord, 40 years old, of CorriganviIIe, Md., Western Maryland Railway hostler and brother of Mrs. Delia Hausman of Connellsville, was killed Saturday when struck by a passenger train at Ridgeley, W. Va. He was walking from the shops and apparently did not hear the approaching train at his back. The funeral services will be held tomorrow afternoon at 2 o'clock at the late home. Mr. Barncord was a director of the Corriganville baseball team in the Interstate League and was an ardent sportsman. [John Barncord] John Bankard[sic], one of the oldest and best known farmers in Garrett county, died at the home of his daughter, Mrs. Lewis Warnick, near New Germany, last Tuesday, aged 81. Cause of death was paralysis. His wife died four years ago. but he leaves two daughters, Mrs. Lewis Warnick and Mrs. Frances Durst, both of New Germany, and one son, Charles, who is in Michigan. The funeral took place yesterday, and interment was made in New Germany. John P. Barncord, 80, died at 10:50 a.m. yesterday at his home in Corriganville, this county. He is survived by his widow and one son, John Barncord, of Phoenix, Ariz. He also leaves a sister and five brothers: Mrs. Amanda Shockley, this city; Oliver, Samuel, Joseph, Edward and Henry Barncord. Rites for Joseph C. Barncord, Sr., 64, of 20 Potomac Street, Ridgeley, who died Friday night, will be held tomorrow at 2:30 p. m. from the residence with Rev. Harold A. Probst officiating. Interment will take place in Hillcrest Burial Park. Mrs. Katherine A. Barncord, aged 88, died Sunday evening at her home in Corriganville from senile decay. The survivors are eight sons and one daughter - H. T. and O. P. Barncord, of Corriganville; John P. Barncord, Ridgeley, W. Va.; D. H. and H. C. Barncord, Cumberland; T. E. Barncord, Harmon, Pa.; and J. C. and S. M. Barncord, of Mount Savage; and Mrs. N. B. Shockley. The funeral services will be held Tuesday afternoon at 7 o'clock from the Methodist Episcopal Church at Corriganville with burial at Wellersburg, Pa.
WESTERNPORT — Kenneth H. Barncord, 56, of 603 Charles Street, Brigadoon, Frederick, died Tuesday at his home. He had been in ill health several months. Born in Mt. Savage, he was a son of the late Royal P. and Mary (Deffinbaugh) Barncord and formerly resided in Westernport. Mr. Barncord was a member of Calvary United Methodist Church and the Leaders Bible Class in Frederick. He was a past master of Hancock Lodge 173, AF & AM; past worthy matron of Hancock Chapter 103, Order of the Eastern Star; a past president of the Gaithersburg Lions Club and was serving as a director of the Frederick Lions Club. An employe of the C & P Telephone Company for 29 years, he currently was employed as foreman-supervisor of PBX installation and maintenance. Surviving are his widow, Agnes (Cheshire) Barncord, formerly of Keyser; a sister, Mrs. Billie J. Fleek, St. Petersburg, Fla.; a brother, R. Price Jr., Baltimore, and three nieces. The body is at the Elchison Funeral Home, 106 East Church Street, Frederick. Services will be conducted tomorrow at 2:30 p.m. at Calvary Church there with burial in Mt. Olivet Cemetery. MT. SAVAGE — Mrs. Louise S. Barncord, 73, died yesterday at the home of a daughter, Mrs. Raymond L. Himmelwright. Born in Baltimore, she had resided in Mt. Savage 40 years. Mrs. Barncord was a daughter of the late William G. and Almedia (Williams) Stewart and widow of Adolph Barncord. She was a member of St. George Episcopal Church. Also surviving is a sister, Mrs. Frank James, Baltimore. The body is at the residence. Mrs. Martha Barncord, 80, widow of John P. Barncord, Corriganville, died last night at her home. She was struck by an automobile December 17. Surviving are a son, John H. Barncord, at home, and a sister. Mrs. Martha Mary Elizabeth Barncord, 76, died this morning at her home in Corriganville. She was married first to David Mosser, and then after his death to Walter Barncord, who has since died. She was born in Cumberland January 10, 1887, the daughter of the late Conrad and Martha Everline Lapp. She is survived by four sons, Olen C. Mosser and Edward S. Barncord, both of Corriganville; David A. Mosser, Rahway, N. J., and Francis Barncord, Virginia; two daughters, Mrs. Catherine Crabtree and Mrs. M. Louise Clites, both of Corriganville; two sisters, Mrs. Julia Martin, Corriganville, and Mrs. Annie Murray, RD 4, Meyersdale; and eight grandchildren. She was a member of St. John's United Church of Christ, Corriganville, and its Sunday School and Ladies' Aid Society. The body will be at the home until noon tomorrow. CORRIGANVILLE — Mrs. Mary Ann (Retallick) Barncord, 79, died yesterday at the home of her son, William Carl Barncord, Cash Valley Road. A native of Midland, she was born May 2, 1872, and was the daughter of John and Rhoda (Hocking) Retallick. Her husband, Henry Orlando Barncord, died in July, 1951. She was a member of the Methodist church. Surviving are three sons, David Henry Barncord, Cumberland; John Mitchell Barncord, RD 5, Cumberland; and William Carl Barncord, Cash Valley Road; a daughter, Mrs. Elsie Heretza Hensel, here; a brother, William Retallick, Aliquippa, Pa.; two sisters, Mrs. Constance Eisentrout and Mrs. Martha Blair, Midland; nine grandchildren and four great-grandchildren. Services Sunday at Corriganville Methodist Church; interment in Hillcrest Burial Park, Cumberland. WESTERNPORT - Mrs. Mary Emma Barncord, 71, of 324 Maryland Avenue, died Friday night after a two-year illness. She was the widow of R. Price Barncord, Sr. A native of Mt. Savage, she was the daughter of the late Mr. and Mrs. John Deffinbaugh. She was a member of Piedmont Trinity Methodist Church and of the Susannah Bible class and Bethlehem Chapter 14, Order of the Eastern Star. She is survived by two sons, Kenneth Barncord, Frederick, and R. Price Barncord, Jr., Baltimore; a daughter, Mrs. Billie Jane Fleek, at home; a sister, Mrs. James Logsdon, Frostburg, and three grandchildren. Services will be held tomorrow at the Boal Funeral Home; interment, Methodist cemetery, Mt. Savage. Mrs. Minnie E. Barncord, aged 70 years, wife of S. M. Barncord, died at her home Sunday afternoon after an illness of several weeks. Mrs. Barncord was born in Germany and came to this country when a child. She is survived by the following children: Mrs. Anna Higgins, Miss Leone Barncord and George Barncord, at home; Robert Barncord, Akron, O.; Mrs. Richard Chaney, Frostburg; Mrs. Lula Houck, Adolph Barncord, and Price Barncord of Mt. Savage. Nineteen grandchildren also survive. Funeral services will be held from St. George's Protestant Episcopal Church, Tuesday at 2:30 p. m. Rev. Dr. J. W. Torkington, rector, will officiate. CORRIGANVILLE — Mrs. Nina Lee Barncord, 33, died yesterday at National Institute of Health, Bethesda, after a lengthy illness. Born in Cumberland, February 23, 1932, she was a daughter of Arthur and Leone Meyers Loeber, Wellersburg. Besides her parents she is survived by her husband, Edward S. Barncord; three sons, Scott, Mark and Eric Barncord, all at home; a brother, Charles Loeber, Grantsville, and a sister, Helen Loeber, Wellersburg. The body is at the Zeigler Funeral Home, Hyndman. A service will be conducted here Friday at 2 p.m. by Rev. John Klindt, pastor of United Church of Christ. Interment will be in Cook's Cemetery. Norman R. Barncord, 85, Harlowton, Mont., died there yesterday. Born in Corriganville, he was a son of the late Oliver P. and Agnes (Bogh) Barncord. Mr. Barncord was a graduate of the West Virginia University School of Law and was an attorney and former judge of Wheatland County, Mont. Surviving are two brothers, Raymond Barncord, Corriganville, and H. Francis Barncord, Melbourne, Fla.; and two sisters, Mrs. Catherine Dobbin, Denver, Colo., and Mrs. Freda B. Bowers, Cumberland. Westernport - R. Price Barncord, 65, of 324 Maryland Avenue, died yesterday in Potomac Valley Hospital, Keyser, where he was admitted Monday. Mr. Barncord had been employed at the Luke plant of the West Virginia Pulp and Paper Company for over 35 years. A son of the late Samuel and Wilhelmina (Bojk) Barncord, formerly of Mt. Savage, he had lived here about 40 years. Mr. Barncord was a member of Kemp Lodge 154 AF & AM, and Jennings Run Council, JOUAM, both of Mt. Savage. He was a member of Trinity Methodist Church, Piedmont, and was active in Boy Scout work, having served for several years as advancement chairman of the Tri-Towns district. Surviving are his widow, Mrs. Mary Emma (Deffinbaugh) Barncord; two sons, Kenneth H. Barncord, Frederick, and R. Price, Jr., Baltimore; a daughter, Mrs. Billie Jane Fleek, at home; two brothers, George Barncord, Bowling Green, and Robert Barncord, Jackson, Mich.; two sisters, Mrs. Anna Higgins, Cumberland, and Mrs. George Houck, Boonsboro, and three grandchildren. The body is at the residence; services Saturday, interment, Mt. Savage Methodist Cemetery. MOUNT SAVAGE - Robert Barncord, 72, a native of here, died yesterday at his home in Jackson, Mich. He is survived by his widow, Mrs. Fern Barncord; a daughter, Susan Barncord, and a brother, George Barncord, Bowling Green. Services will be conducted tomorrow in Jackson. Mt. Savage, Oct. 5 - Samuel M. Barncord, 70, retired carpenter for the Union Mining Company, died today at his home. A native of Corriganville, he had lived there 50 years and was a member of Kemp Lodge No. 154, AF & A Masons; Jennings Run Council, Jr. OUAM and St. George's Episcopal church. He is survived by the following children: Mrs. Anna B. Higgins and Mrs. R. L. Himmelwright, Mt. Savage; Mrs. George Houck, Grantsville; Mrs. Agnes Chaney, Price Barncord, Westernport; George H. Barncord, Cumberland; and Robert Barncord, Jackson, Mich.; a sister, Mrs. Ann Shockey, Mt. Savage; three brothers, Harry, of Corriganville; Edward, of Hyndman; and Joseph Barncord, Cumberland; 20 grandchildren and one great-grandchild. The 21-months-old daughter of former residents of Cumberland was the victim of a hit-and-run driver yesterday in New Britain, Conn. She was Sherri Lynn Barncord, daughter of Mrs. Barbara Jo (Purdham) Barncord, 574 West Main Street, New Britain, and Gary M. Barncord of San Francisco. She was born in Cumberland, October 20, 1965. According to authorities in New Britain, the child stepped off a curb in front of her home and was struck by a van truck. Witnesses said the driver failed to stop after striking the child. The accident occurred shortly after 11 a. m. and the child died in surgery at 1 p. m. in the New Britain General Hospital. Besides her parents, she is survived by a sister, Laura Jean, at home; the paternal grandparents, Mr. and Mrs. William C. Barncord, Greenpoint, LaVale, and the maternal grandparents, Mr. and Mrs. Joseph Purdham, 303 Clement Street, city. The body will be returned to the George Funeral Home. HYNDMAN — Tolbert Edward Barncord, 93, died this morning in Bedford County Memorial Hospital, Bedford. A retired engineer for the Baltimore and Ohio Railroad Company, he held membership in Hyndman United Church of Christ and the Masonic fraternity. His wife, Mrs. Lucinda (Geller) Barncord, preceded him in death. Surviving are a son, Walter E. Barncord, Hyndman; a daughter, Mrs. Ethel Hull, Chambersburg, and six grandchildren. The body is at the Ziegler Funeral Home where services will be conducted Sunday at 2 p. m. by Rev. John Zinn. Interment will be in Dry Ridge Cemetery. Mrs. Vada Drumm Barncord, 65, of 854 McMullen Highway, died yesterday at her home. A native of Vale Summit, she was a daughter of the late John F. and Priscilla (Knippenberg) Drumm. Mrs. Barncord was a retired stenographer for the Baltimore and Ohio Railroad and was last employed at the Bolt and Forge. She was a member of SS. Peter and Paul Catholic Church, Catholic Daughters of America, and the Christian Mothers. A past president of Allegany County Republican Women's Club, she also was a member of the Women's Auxiliary of El Fidel Club, the Hap-0-Happy Club, Civic Club, Business and Professional Women's Club, and the Baltimore and Ohio Veterans Association. Surviving are her husband, George H. Barncord; a brother, Walter J. Drumm, and a sister, Mrs. Rose Loible, both of city, and several nieces and nephews. The body is at the Silcox Funeral Residence where friends will be received from 2 until 4 and 7 until 9 p. m. Requiem mass will be celebrated Thursday at 10 a. m. at SS. Peter and Paul Church. Interment will be in the parish cemetery. Walter Scott Barncord, 61, retired Baltimore and Ohio telegraph operator, died late yesterday at his home in Corriganville. He had been ill two years. Mr. Barncord, a native of Corriganville, was the son of the late Scott and Louise Barncord, and a member of the Corriganville Reformed Church. Surviving are his widow, the former Miss Martha Elizabeth Lapp, and the following children: Francis Barncord, Baltimore; Miss Louise Barncord, at home; and Edward Scott Barncord, Corriganville. Also surviving are three step-children: Olen Mosser, Mrs. Chester Crabtree, and David Mosser, Trinidad. Services will be conducted Thursday from the Reformed Church with the Rev. George Raymond Winters, assisted by the Rev. Andrew W. Von Kaske, officiating. Interment will be in Greenmount Cemetery. Information has just reached relatives in this city of the tragic death of Mrs. Augusta Barnes, formerly of Flemington, this county, at Keller, Washington. Mrs. Barnes and daughter were crossing a bridge over a swollen stream, and the daughter lost her balance and fell. Mrs. Barnes immediately jumped into the stream to save her loved one, and she was drowned in the attempt. The girl was rescued by a man, and later the remains of the heroic mother were recovered and interred at Keller. FORT ASHBY — Mrs. Bertha V. Barnes, 85, died Monday in Sacred Heart Hospital. A native of Fort Ashby, she was a daughter of the late Solomon E. and Allie E. (Dennison) Alkire. She was preceded in death by her husband, Harley V. Barnes. Surviving are three daughters, Mrs. Audra M. Blamble, Mrs. Ester P. Rexrode, and Mrs. Ruth I. Travis, all of Fort Ashby; four sons, Edgar V. Barnes, Ralph R. Barnes, Herbert D. Barnes, all of Fort Ashby; Richard L. Barnes, Winchester, Va.; four sisters, Mrs. Pearl Baker, Mrs. Grace Malone, Mrs. Pansy Dohrman, and Mrs. Hazel Troutman, all of Fort Ashby; one brother, James D. Alkire, Fort Ashby; 18 grandchildren and 20 great-grandchildren. The body is at the Shaffer Funeral Home, Romney. Services will be conducted in the funeral home Thursday. Rev. John Garrison and Rev. Paul Sudder will officiate, with burial in Fort Ashby Cemetery. Burton Barnes, 68, of Jeannette, Pa., died July 1 in a hospital there. A native of Barnes' Gap in Bedford County, he was a son of the late George W. and Sarah Jane (Diehl) Barnes. Mr. Barnes was a retired carpenter and a member of the First Methodist Church in Jeannette. Surviving are his widow, Mrs. Clara (Creek) Barnes; two daughters. Mrs. Hilda Antolini and Mrs. Gladys Small, both of Jeannette: a son, Carl Barnes, Waldorf, Md. ; a brother. Nelson Barnes, Everett, Pa.; two sisters, Mrs. Cora Appold and Mrs. Amanda Weimer, both of Cumberland; six grandchildren and four great-grandchildren. Services were conducted in Jeannette July (no date was printed) and burial was in Twin Valley Cemetery. Charles E. Barnes, 43, of Hyndman, died at the Cumberland Memorial Hospital, March 29, 1960, after becoming ill while at work at the Celanese Corporation of America. Death was attributed to a heart attack. He was born March 3, 1917, in Berlin, a son of Charles and Virgie (Schilling) Barnes. He is survived by his widow Mary Liller, whom he married on March 7, 1958. He is also survived by his brother, James A. Twigg of Eckard, Md., and a sister Mrs. Emma Evans of Cleveland, Ohio. He was a member of the Hyndman Reformed Church, Hyndman Volunteer Fire Company, and a veteran of World War II, serving in the Army. Funeral Services: Saturday at 2 P.M. in the Zeigler Funeral Home with the Rev. John F. Sammuel officiating, with interment in the Lybarger Cemetery. Friends may call at the funeral home from 2-4 and 7-9 p.m.
about 29 March, 1960; No date or source noted. FORT ASHBY, W.Va. — Daniel “Dan” Webster Barnes, 47, of Fort Ashby, died Saturday, May 18, 2002, at Sacred Heart Hospital, Cumberland, Md. Born Dec. 24, 1954, in Springfield, he was the son of the late Edgar V. and Virgie Mae (Keplinger) Barnes. He had served in the U.S. Army. Mr. Barnes was a ballistics engineer at ABL. Survivors include his son, David W. Barnes and wife Ursula, Sitka, Ala.; one brother, Harley L. Barnes, Fort Ashby; four sisters, Bertha McCormick, Winchester, Va., Ada Lou Queen, Fort Ashby, Anna M. Goldizen, Maysville, and Tamela “Susie” Peer, Fort Ashby; and two grandchildren, Kirsten and Trevor Barnes. Friends will be received at the Upchurch Funeral Home, Fort Ashby. Funeral services will be conducted at the funeral home on Wednesday with Marshall Carder officiating. Interment will be in Fort Ashby Cemetery. FORT ASHBY, W.Va. — Dora M. Barnes, 74, of Fort Ashby, died Tuesday, May 30, 1995, at the Scared Heart Hospital, Cumberland. Born Nov. 30, 1920, at Fort Ashby, she was the daughter of the late Juanita (Bosley) Anderson Simpson, and was the adopted daughter of the late Herbert and Irene Bosley. Mrs. Barnes was also preceded in death by her husband, Woodrow Wilson Barnes, on Feb. 2, 1972. Surviving are three sons, Howard B. Barnes, Harrisonburg, Va., Robert E. Barnes and Clyde S. Barnes, both of Fort Ashby; four daughters, Bernadine M. Cottrell, Grafton, Ohio, Catherine E. Jeffrey, Fort Ashby, Donna M. Nichols, Romney, W.Va., and Betty R. Barnes, at home; two half-brothers, Paul Anderson, Short Gap, W.Va., and John Anderson, Cumberland; one half sister, Mary Getz, Keyser, W.Va.; 16 grandchildren; and two great-grandchildren. Friends will be received at the Rotruck-Smith Funeral Home, Keyser, on Thursday. Services will be conducted in the funeral home chapel on Friday with the Rev. Rodney L. Casteel Sr. officiating. Interment will be in the Fort Ashby Cemetery. A 16-year-old Fort Ashby area youth drowned in a pond on his father's farm yesterday afternoon in the Dennison Hollow section when he waded into water beyond his depth and disappeared under the surface. The victim, Edgar Dale Barnes, was unable to swim and had gone to the pond, with his sister, Anna Mae Barnes, a brother, Harley Lee Barnes, and a neighbor child, Patsy Grapes. After going under suddenly he reappeared and called for help, but the others in the group thought that he was pretending to be in trouble and did not go to his aid. When the youth did not surface after going under a second time, the Grapes child ran to notify her mother who hurried to the home of a neighbor, Ted Bennett, and she also notified the victim's father who was working a short distance from the Bennett home. The Fort Ashby Fire Company ambulance rushed to the scene with respirators and Wayne Linn, 15, of Fort Ashby, plunged into the pond and recovered the body. The respirators were used, but the boy could not be revived. Dr. J.D. Brown, of Romney, was called to the scene and pronounced the victim dead. The victim was born in Fort Ashby, October 29, 1942, and was a son of Edgar V. and Virgie (Keplinger) Barnes. He would have been in the junior class at Fort Ashby High School this fall, and was a member of the Future Farmers of America chapter of that school. Besides his parents he is survived by two brothers, Harley Lee and Daniel Webster Barnes, at home; three sisters, Mrs. Bertha Jane McCormick, Winchester, and Miss Adalou and Miss Anna Mae Barnes, both at home. The body is at the Scarpelli Funeral Home. SPRINGFIELD , W.Va. - Edgar V. Barnes, 73, of RD 1, died Monday in the Memorial Hospital Hospice, Cumberland, Md. He was born here Jan. 25, 1914, son of the late Harley V. and Bertha V. (Alkire) Barnes. Mr. Barnes was a Navy veteran of World War II and was a member of Fort Ashby Post 6667, Veterans of Foreign Wars. He was retired from the West Virginia Department of Highways. Survivors include his widow, Virgie A. (Keplinger) Barnes; two sons, Harley Lee Barnes and Daniel Webster Barnes, both of Springfield; four daughters, Bertha Jane McCormick, Winchester, Va.; AdaLou Queen, Points; Anna Mae Goldizen, Maysville; and Pamela Sue Peer, Springfield; two brothers, Richard Barnes, Winchester; and Herbert Barnes, Springfield; three sisters, Esther Rexrode and Ruth Travis, both of Fort Ashby; and Audrey Blamble, Springfield; and nine grandchildren. Friends will be received in the Fort Ashby Funeral Home. Lonaconing, Md., Word has been received here of the death of Edward Sherman Barnes, 72, in St. Anthony's Hospital, Rockford, Illinois. Mr. Barnes was a native of Lonaconing, the son of Jefferson and Amanda Dye Barnes. He left here with his parents when but seven years of age, settling in Illinois. He was married twice, both wives preceding him in death. He is survived by two children, a son Jefferson in California and one daughter Mrs. Fern Leigh, Oregon, Ill. Also surviving are four grandchildren and a sister. A number of relatives are living in this section. FROSTBURG — Mrs. Ethel Barnes, 62, wife of Henry S. Barnes, Midlothian, died today in Miners Hospital. She had been iII since Sunday. A native of Midlothian, she was a daughter of the late Charles C. and Agnes (Kiers) Brode. Mrs. Barnes was a member of Shaft Methodist Church. Surviving, besides her husband, are a son, Gilbert L. Barnes; a daughter, Mrs. Charles Ware; a foster daughter, Mrs. Alex Middleton; a brother, Howard Brode, all of Midlothian, and seven grandchildren. The body wilI be at the Durst Funeral Home after 7 p. m. today and services will be conducted there at 2:30 p. m. Friday. Rev. Louis Emerick, former pastor of Shaft Church, will officiate and interment will be in Frostburg Memorial Park. REVIEW, ROMNEY OF 6TH - Mrs Gertrude Barnes, wife of Albert Barnes, died at her home on Jersey Mt, Wed night, after a protracted illness from consumption, aged about 35 years. CORNWALL, Conn. - Mrs.Helen Barnes, 67, of RD 4, formerly of Frostburg, died suddenly Saturday. Born Jan. 14, 1919, she was the daughter of the late George G. and Edith (Price) Jeffries. She was preceded in death by one brother. Mrs. Barnes was a graduate of Beall High School, the Maryland Institute of Art in Baltimore and New York School of Design. She was a self-employed interior designer and a vestry member of Christ Episcopal Church, Sharon. Surviving are one son, John A. Barnes, Cambridge, Mass. ; two daughters, Mrs. Susan Burnham, Ashville, N.C., and Frances G. Barnes, Remsenburg, N.Y.; one sister, Mrs. Susan Felton, Milford, Pa., and four grandchildren. Services will be conducted at Christ Episcopal Church Monday at 2 p.m. by the Rev. Gilbert Larson. The family requests that memorials take the form of contributions to the Christ Episcopal Church. FROSTBURG — Henry S. Barnes, 85, of Midlothian, died yesterday at the Cuppett-Weeks Nursing Home, Oakland, where he had been a patient 14 months. Born in Vale Summit, he was a son of the late William H. and Ellen J. (Loar) Barnes. His wife, Ethel (Brode) Barnes, preceded him in death. Mr. Barnes was a retired farmer and coal operator. He was a member of Shaft United Methodist Church, and Jr. OUAM 11, Frostburg. Surviving are one daughter, Mrs. Charles Ware, Midlothian; one son, Gilbert Barnes, Midlothian; one sister, Mrs. Lucille Winters, Midlothian, and five grandchildren. The body is at the Durst Funeral Home where friends will be received from 2 to 4 and 7 to 9 p.m. A service will be conducted there tomorrow at 1:30 p.m., with James F. Pryor in charge. Interment will be in Frostburg Memorial Park. Pallbearers will be Thomas Williams, Peter Brown, Alvin Brode, William Watson, Charles Hotchkiss and William Duncan. James William Barnes of Hyndman died in Bedford County Home July 25, 1957. He was born May 14, 1888, in Peoria, Illinois, a son of Mr. and Mrs. Herman VonMilldradtt. He was married to Virgie Shilling, who preceded him in death. Surviving are three children: Charles Barnes of Hyndman, Mrs. Emma Evans of Cleveland, O., and a stepson James Albert Twigg of Eckard, Md. Two grandchildren survive. Funeral services Sunday, 2 p.m in Zeigler Funeral Home, Rev. Charles Evans officiating with interment in Lybarger Cemetery. Friends are being received in the funeral home. DAWSON REPORT, Dec 11 - John Barnes, an aged citizen of Bier, died Nov 27, age 67 years. Mr Barnes was well known along the Potomac Valley, having been in the employ of many of the farmers. Funeral services were conducted at the house by Rev S D Dawson, after which the remains were laid to rest in the Bier cemetery. He leaves an aged wife and several children to mourn his departure. grown children. The funeral will be held this afternoon. -Cumb News of 26th. EVERETT, Pa. - J. Nelson Barnes, 76, of R D 2, Everett, died Sunday in Bedford County Memorial Hospital, after a long illness. Born in Fulton Co., he was a son of the late George W. and Sarah J. (Diehl) Barnes. His first wife, Callie M. (Potts) Barnes, died in 1924. Mr. Barnes was a retired farmer and was a member of Fairview Christian Church. Surviving are his widow, Virginia (Conrad) Barnes; five children, Mrs. Iva L. Markowitz, Glassport; Mrs. Mildred Hawn, Huntington; Mrs. Edith Clark, Everett; J. Walter Barnes, Flintstone; Mrs. Helen Pittman, RD 2, Everett; two sisters, Mrs. Amanda Weimer and Mrs. Cora Appold, both of Cumberland; 17 grandchildren and three great-grandchildren. Conner Funeral Home. Services will be conducted there tomorrow at 2 p. m. by Rev. Paul Gettinger. Burial will be in Clearville Union Cemetery. Ray Hardy Barnes, 58, Fort Ashby, was dead on arrival yesterday at Hampshire Memorial Hospital, Romney. Born in Springfield, he was a son of Harley V. and Bertha (Alkire) Barnes, who survive. He was employed as a heavy-duty equipment operator by the West Virginia State Road Commission and was a member of VFW Post 66, Fort Ashby Volunteer Fire Company and a veteran of World War II. Besides his parents, he is survived by his widow, Grace E. (Garland) Barnes; a son, Garland E. "Sam" Barnes, Fort Ashby; four brothers, Edgar V. and Herbert D. Barnes, Springfield; Richard L. Barnes, Winchester, Va.; and Ralph R. Barnes, Fort Ashby; three sisters, Mrs. Lee Blamble, Springfield; Mrs. Esther Rexrode and Mrs. Ruth Travis, Fort Ashby; and three grandchildren. The body is at the Scarpelli Funeral Home, where a memorial service will be held tomorrow at 8 p.m. by the Fort Ashby VFW. Services will be conducted Monday at Fort Ashby Methodist Church at 10 a.m. with Rev. Charles Starkey officiating. Interment will be in Fort Ashby Cemetery. Mrs. Virgie Joanne Barnes of Hyndman died at the Memorial hospital in Cumberland early Monday evening, December 7, 1953. She was born April 9, 1886 in Snyder, Mifflin county, the daughter of Aaron and Maliuda (Wagner) Shilling. She is survived by her husband, James William Barnes; a son, Albert Twigg, Eckhart, Md. : a daughter, Mrs. Emma Evans, Hyndman, and another son, Charles Barnes, Hyndman. Also surviving are a brother, Edward Shilling, Hyndman, and two sisters, Mrs. Bertha Balke, Philadelphia, and Mrs. Emma Mays, Hyndman. Mrs. Barnes was a member of the Reformed church, Hyndman, the Ladies Auxiliary of the Hyndman Firemen, and the Ladies Auxiliary of the Hyndman Reformed Church. Funeral services: Thursday afternoon at 2 o'clock at the Zeigler funeral home, the Rev. F. B. Oberkircher, pastor of the Reformed church, Hyndman, officiating. Interment in the Lybarger cemetery. Friends will be received at the funeral home. Mrs. Alice J. Barnett, 1501 Frederick street, widow of J. Scott Barnett, died today at her home. She was a daughter of the late Mr. and Mrs. George Sponseller. Surviving are four sons, Charles, Ralph and Ned, all of Cumberland, and Hubert, Wilkinsburg, Pa; seven daughters, Mrs. James Stewart and Mrs. Harry Menhorn, Wilkinsburg, Pa.; Mrs. Minnie Baskerville, Pittsburgh; Mrs. Louis Hoffman and Mrs. Vernon Andrews, this city; Mrs. Francis Worth, Chambersburg, Pa.; Mrs. Margaret Everline, LaVale; two brothers, Charles Sponseller, Everett, Pa.; Louis Sponseller, Saluvia, Pa.; two sisters, Mrs. Howard Putt, New Castle, Pa., and Mrs. John Rhodes, Valley Forge, Pa.
Charles S. Barnett, 72, of 1501 Frederick Street, died yesterday at Memorial Hospital. Born in Chattanooga, Tenn., he was a son of the late J. Scott and Alice Jane (Sponsler) Barnett. He was master mechanic for the Hazelwood Construction Company. Surviving are his widow, Albertha (Zies) Barnett; a step-son, Joseph Deneen and a stepdaughter, Mrs. Nelda J. Andrews, both of Cumberland; two brothers, Ralph N. Barnett, Morgantown, W. Va., and Ned W. Barnette, Hagerstown; three sisters, Mrs. Minnie Baskerville and Mrs. Ruth Menhorn, Pittsburgh; and Mrs. Charlotte Adams, Cumberland. The body is at the Stein Funeral Home. A service will be conducted there Sunday at 2 p.m. Rev. Benjamin R. Bruner will officiate and interment will be in Hillcrest Burial Park. Mrs. Florence R. Barnett, 72, Murraysville, Pa., and formerly of Ridgeley, died Sunday at Sacred Heart Hospital. Born in Westernport, she was a daughter of the late John and Emma (Burkett) Null. Her husband, Herbert E. Barnett, preceded her in death. Surviving are one daughter, Mrs. Melba Shaw, Murraysville; two brothers, John Null, this city; Kenneth Null, Ridgeley; three sisters, Mrs. Mae Valentine, Mrs. Maryland Logsdon, both of Ridgeley; Mrs. June Stein, city; and three grandchildren, and three great-grandchildren. The body will be taken to Harts Funeral Home, Murraysville. Herbert E. Barnett, 4?, (the second number looks like a 5 or 3, but is rather unreadable) formerly of Cumberland, died of a heart attack Friday night at his residence, 401 West Street, Wilkinsburg, Pa. A veteran of World War I, Mr. Barnett was a son of the late Mr. and Mrs. Scott Barnett, this city. He had been employed by the Pittsburgh-Lake Erie Railroad. Surviving are his widow, Mrs. Florence (Null) Barnett; a daughter, Mrs. Gordon Shaw, Wilkinsburg; three brothers, Charles, Ralph and Ned Barnett, all of Cumberland; six sisters, Mrs. Harry Menhorn and Mrs. Nell Stewart, Wilkinsburg; Mrs. Lynn Basterbill, Pittsburgh; Mrs. Vernon Adams and Mrs. Harold Everline, this city, and Mrs. Al Worth, Chambersburg, Pa., and three grandchildren. The body is at the Turner Funeral Home, Wilkinsburg. Funeral services for J. Scott Barnett, 63 years old, who died Friday night, May 15, at his home in Cumberland, Md., were conducted at 9 o'clock Sunday night at the home by the Rev. Howard Schlinke, pastor of the First Methodist Protestant Church, Cumberland, of which church he was a member, and the body was brought to Everett on Monday for interment. Mr. Barnett had been a resident of Everett until several years ago and was very well and favorably known. Surviving are his widow, 11 children, three sisters and one brother. HARDY COUNTY NEWS - John Barnett, a native of Lost River, this county, died at his home in Barbour Co recently. Spouse: Lee C. Barnett, Jr.
HAGERSTOWN—Ned W. Barnett, 68, of 248 Bryan Place, died yesterday. He was a former resident of Cumberland. Born in Everett, Pa., he was a son of the late Scott and Jean Barnett. He was a member of the Church of the Nazarene and was a retired Fairchild Corp. employe. Surviving are his widow, Eleanor V. (Arnold) Barnett; a son, Rev. Douglas A. Barnett, Monroe, Mich.; two sisters, Mrs. Charlotte Adams, Cumberland, Mrs. Ruth Menhorn, Pittsburgh; a brother, Ralph Barnett, Cumberland, and two grandchildren. The body is at the Minnick Funeral Home, 415 East Wilson Boulevard. A service will be conducted Saturday with interment in Rest Haven Cemetery. Funeral services for Thomas Barnett, aged 91, who died Friday, were held yesterday afternoon at the home of his daughter, Mrs. William P. Rizer, 441 North Centre street. Rev. Dr. H. T. Bowersox, pastor of St. Paul's Lutheran Church, officiated. Interment was in Allegany cemetery, Frostburg. The pallbearers were Frank Smith, William W. Garrett, LeRoy Kimes, Ira K. Little, George W Brown and Harry B. Simpson. MEYERSDALE. Pa. - Mrs. Fannie E. Barnhart, 79, died yesterday at Somerset Community Hospital following a long illness. She was a native of Meyersdale, born November 29, 1886, a daughter of the late Atha and Sarah (Weimer) Housel. She is survived by two brothers, Harry Housel and Cyrus Housel; a sister, Mrs. Tracy Klink, all of Meyersdale, and three grand children and 9 great-grandchildren. The body is at the Price Funeral Home here where friends will be received. Funeral services will be held Wednesday at 2 p.m. with interment in Union Cemetery. Rev. Victor Vogel, pastor of Amity United Church of Christ, will officiate. Jacob Barnhart, died June 5th at this home near Hancock Md, of infirmities, aged 88 years. Meyersdale, Pa., Nov. 26 - Joseph Barnhart, 48, died Wednesday morning at his home on Large street, after an extended illness. He was a son of William and Tillie (Burkett) Barnhart. In addition to his parents, he leaves his widow, Mrs. Susan (Hoyman) Barnhart; two children, William, Baltimore, Md. ; Mrs. Glenn Baer, Meyersdale; an adopted daughter, Ruth, at home; a brother, Norman, Meyersdale; and two sisters, Mrs. Mary Swingell, Meyersdale, and Mrs. Dorothy Ohler, Baltimore. "Mrs. Catherine Barnhill died at the home of her son, Mr. James Barnhill, on Harrison street, Sunday May 15, 1910, aged 78 years. She is survived by the following children: Mrs. Elizabeth Shillingberger, Mrs. Mary Jones and Mrs. Jesse Carney, of Wabash; Mrs. Sarah Bean, of Barton; Mr. Thos. B. Barnhill, of Luke and Mr. James Barnhill, of Piedmont. The funeral took place from St. Peter's Catholic church Wednesday morning. The services were conducted by Rev. Father Gallagher. Interment in the Cross burying ground." "James Charles Barnhill, 30, died Sunday in a Baltimore hospital. Funeral mass was held yesterday morning at St. Patrick's Catholic church, Cumberland, with interment in St. Patrick's cemetery, there. A son of Mrs. Elizabeth Ellis Barnhill and the late Thomas Barnhill, he was born in this community but spent most of his life in Cumberland." "While attempting to board the B&O accomodation train at Bloomington yesterday, Mr. Jos. Barnhill of Windom Hill fell beneath the wheels having both legs mangled requiring amputation. Mr. Barnhill died about seven the same evening. His sister, Mrs Alex. Donley of Coketon is also dead, and both will be buried at Cross Saturday." "Cumberland-Mrs. Theresa M. Barnhill, 81, wife of James F. Barnhill, died Sunday at her residence, 113 Columbia street. Born in Scotland, Mrs. Barnhill was a daughter of the late Robert and Margaret Kennedy Donnelly. She resided in Piedmont for a number of years before moving to Cumberland. Besides her husband, she is survived by three sons: James P., Joseph M., and Robert P. Barnhill; two daughters, Mrs. Elizabeth Dreyer and Mrs. Theresa Haselbeck, this city; two sisters, Mrs. Catherine Murray and Mrs. Eliza Barnhill, both of Pittsburgh, Pa., several grandchildren and three great grandchildren. Requiem mass was held yesterday morning at St. Patrick's Catholic church and interment was in St. Patrick's cemetery." BARNICK – Carol Ann (Shaulis), 66, Boswell, passed away peacefully Dec. 19, 2013, at In-Touch Hospice House, Somerset. Born Feb. 2, 1947, in Johnstown, daughter of Robert D. and Amelia (Lepter) Shaulis. Preceded in death by parents and son-in-law, Jeffery Montgomery. Survived by husband of 37 years, Ross Barnick; daughters, Suzanne (Bjes) Montgomery, married to Nathan Kelly, Rockwood; and Tiffany (Bjes), married to Michael Mowry, Boswell; Montgomery grandchildren, Cory, Jeremy, Kevin and J. Cole; Kelly grandchildren, Amber and Autumn; Mowry grandchildren, Grant and Garrett; and brother, Robert Shaulis, Boswell. Also remembered by many special friends and family that were with her till the end. A 1965 graduate of the former Jenner-Boswell High School. She worked at several jobs in the area for many years. Carol enjoyed yearly beach trips with her friends and traveling with her husband Ross. Friends will be received from 3 to 6 p.m. Sunday at Hoffman Funeral Home & Cremation Services, 409 Main St., Boswell. A graveside service will be held at 11 a.m. Monday at Jenner Crossroads Cemetery, Pastor Larry C. Hoover, presiding. In lieu of flowers, donations in Carol’s memory may be sent to In-Touch Hospice House, P.O. Box 1173, Somerset, Pa. 15501.